Just a quick post to start the day off. If you’ve ever been involved in election campaigning, or even event promoting, you’ll know just how tricky it is to produce an effective campaign leaflet. After trudging miles around the streets sticking them through peoples’ letter boxes, you have the 15 seconds it takes for them to pick it up off the doormat to when they drop it in the kitchen bin to make an impact and get your message across. There’s a real skill to good design and every constituency party prays a graphic designer will be among their members. So when I come across good leaflet examples, I’m always in awe. And this Labour Party one from the Kentish Town by-election is a doozy. Great ratio of images to words, while still reinforcing the narrative. Brilliant. Though it’d be even better if they’d spelt democrats correctly. I have a thing about misspelling of words on leaflets, even when it’s deliberate. 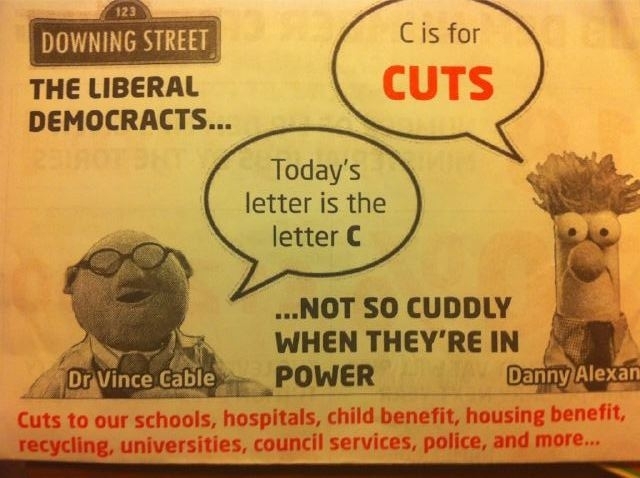 Lib Dems – Not so cuddly when they’re in power. Genius.